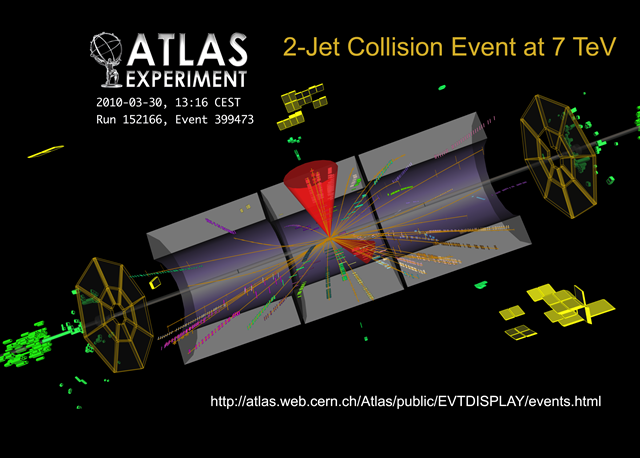 Posted by gordonwatts in ATLAS, LHC. That isn’t to say there is a lot of work left to do. These are at an energy 900 GeV, which is much less than the 7,000 GeV energy they plan to get up to by the end of running in 2010. And the beams are not very intense yet. Still!!! I’m currently in Seattle – I wish I could have been there for this. Being in or around the control room – though I would have been mostly in the way for this phase. Unlike at the Tevatron, I wasn’t really responsible for any bit of the detector or DAQ at ATLAS – and those are the people that need to be there right now. Still, I would have loved to have been there. So, taking that sentiment to the limit. I must now ignore the LHC and get back to preparing for class! Must. Not. Look. At. Accelerator. Status. <said in best Cptn’ Kirk voice>. (more events will be posted here as they show up). Posted by gordonwatts in ATLAS, Fermilab, LHC, Tenure, university. The biggest, most expensive physics machine in the world is riddled with thousands of bad electrical connections. For us, bad means that the connection isn’t going to conduct as much current as it could (I had a blog post about this a while back – but this article contains an excellent explanation – well worth registering if you have to to read it). And this is the reason behind the timing of this article. 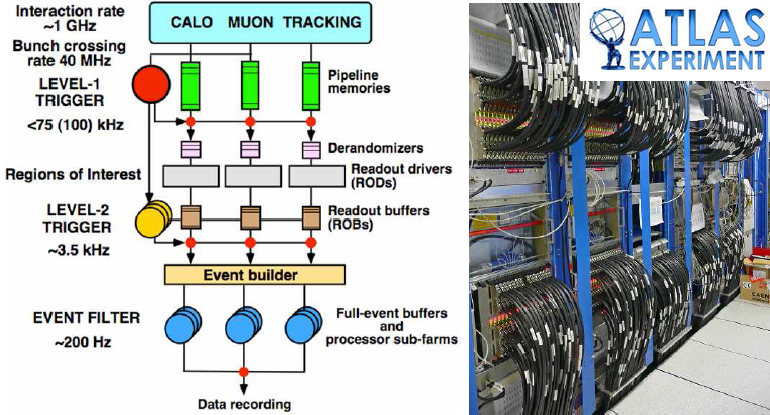 As I mentioned in that article it would not be until the beginning of August that the LHC group of scientists would have finished measuring all those connections – all those splices – and know exactly how bad they were. Tomorrow the LHC and CERN will announce exactly what energy they will run the LHC at initially. And that is the bad part of the news. 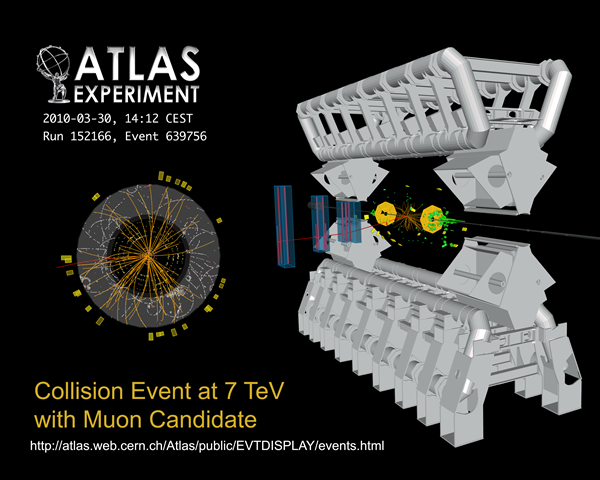 The bad connections mean that we can’t run at the full 14 TeV energy – we will run something short of that (I’m betting it will be 7.5 TeV – if I get it right it isn’t because I have inside information from the accelerator group!). The article is correct that running at this reduced energy won’t give us the access to the science we’d all expected and hoped for if we were running at 14 TeV. But another thing to keep in mind is: we need data. Any data. And not to discover something new – because we need to tune up and commission our detectors! We’ve never run these things in anything but a simulated collider environment or looking for cosmic rays. We would probably be able to keep ourselves busy for almost a year with two months of data. “These are baby problems,” said Peter Limon, a physicist at the Fermi National Accelerator Laboratory in Batavia, Ill., who helped build the collider. Nima, whom I also know (and like), is a theorist. If an experimentalist said this we would all make them run outside turn around three times, and spit to the north to cancel the jinx they would have just placed on the machine. I think we can all guarantee that there are going to be other failures and problems that occur. We hope none of them are as bad as this last one. But if they are, we will do exactly what we’ve done up to now: pick up the bits, study them, figure out exactly what we did wrong, and then fix it better than it was originally made, and try again. The story behind this is fascinating because it is where science meets humanity. The machine across the ocean is the Tevatron at Fermilab (I’m on one of the experiments there, DZERO). There is plenty of science still there, and the race for the Higgs is very much alive – more so with each delay in the LHC. So scientifically it is attractive. But, there is also the fact that a graduate student in the USA must use real data in their thesis. Thus the delays in the LHC mean that it will take longer and longer for the graduate students to graduate. 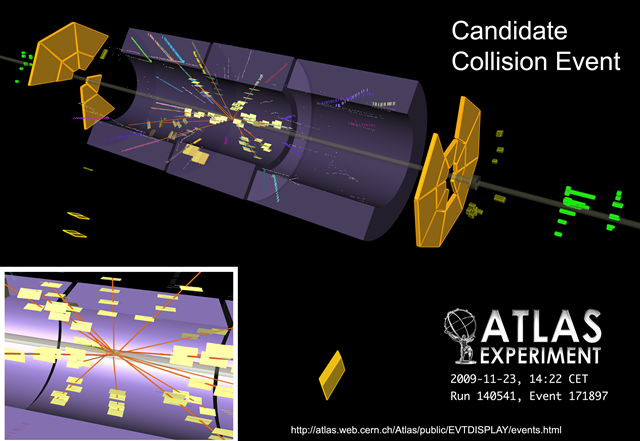 In the ATLAS LHC experiment the canonical number of graduate students quoted I hear is about 800. Think of that – 800 Ph.D.’s all getting ready to graduate – about 1/3rd or more of them waiting for the first data (talk about a “big bang”). Unfortunately, you can’t be a graduate student forever – so at some point the LHC is taking long enough and you have to move back to the USA in order to get a timely thesis. Similar pressures exist for post-docs and professors trying to get tenure. UPDATE: Just announced earlier today: they will start with 3.5×3.5 – that is, 7 TeV center of mass. This is exactly half the design energy of the LHC. The hope is that if all runs well at that energy they can slowly ramp up to 4×5 or 8 TeV. At 8 things start to get interesting as a decent amount of data at 8 will provide access to things that the Fermilab Tevatron can’t. Fingers crossed all goes well! Posted by gordonwatts in LHC, physics life. That is the CMS detector, taken apart. Stunning, huh? 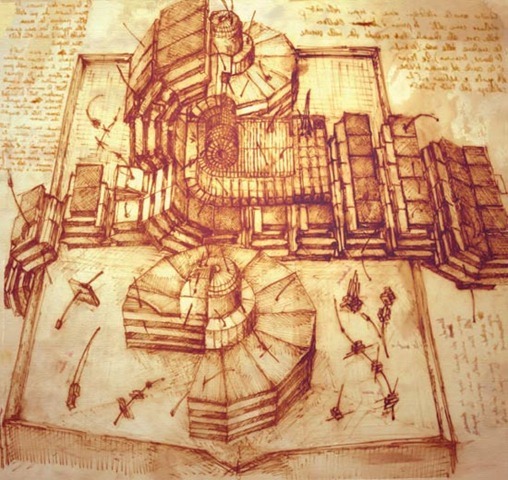 Obviously, Da Vinci didn’t draw that – rather a member of the CMS collaboration, Sergio Cittolin, did. He is the project leader for the trigger and data acquisition systems for CMS. Apparently they are on the cover of the CMS physics Technical Design Reports (TDRs). Sadly, as I have only the electronic version, I never caught this! The drawings are beautiful. I want some large poster size ones to hang up outside my office at UW! I found this in a Physics World article.